Abbott Laboratories, Inc. reported an almost 4 percent increase in profit, driven by strength in its diagnostics and medical device businesses that offset falling sales in its nutrition business. The company’s nutrition business, which includes baby formula Similac and other beverages for children and adults, struggled in the fourth quarter, posting a 3.7 percent decline in total sales. The Lake Forest, Illinois-based company reported a fourth quarter profit of $798 million, or 53 cents per diluted share, compared with $767 million, or 51 cents, a year ago. Earnings per share adjusted for acquisition-related expenses and other items came to 65 cents, beating the analysts’ expectation by one cent. Revenue rose 2.8 percent to $5.33 billion from $5.19 billion in the year-ago period. International sales fell 8.1 percent, due to challenges in the Chinese market. New food safety regulations led to an oversupply of product, said CEO Miles White in an earnings call with investors. White said that he expects localized research and development, as well as a strong global supply chain, will help the company rebound in China. Sales growth in other units made up for the disappointing nutrition business’ results. Sales rose 3.3 percent in the diagnostics business. This was due, in part, to gaining European approval for the company’s Alinity systems, tools that allow doctors and researchers to run diagnostic tests faster and in a smaller space. Strong international sales in the company’s diabetes care portfolio drove revenue increases in the medical device business. Abbott’s FreeStyle Libre glucose monitoring system, which eliminates the need for finger sticks, was popular among European consumers, White said. The company plans on bringing the consumer version of Libre to the U.S. in fall 2017, White said. 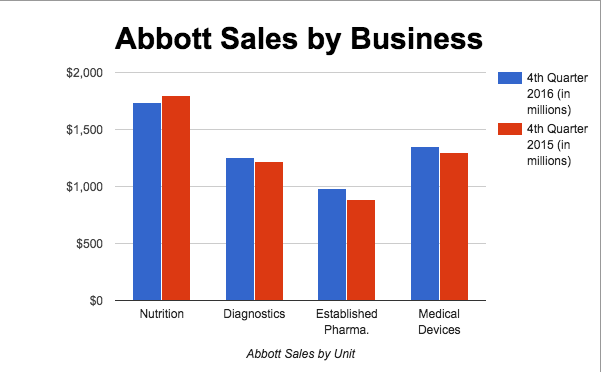 2016 was a year of strategic reshaping for Abbott, in which they sold off parts of their business and acquired others. The company completed an acquisition of Minnesota-based medical device manufacturer St. Jude Medical, Inc. for $25 billion in early January, strengthening its portfolio of cardiovascular devices. Abbott sold off its eye surgery business to Johnson & Johnson, Inc. for $4.325 billion in September. In December, it sold parts of St. Jude’s and Abbott’s vascular closure businesses to Japanese medical device company Terumo Corp. for $1.12 billion. Analysts are optimistic that these deals will pay off long term. Despite analyst optimism, Abbott’s acquisition of St. Jude comes with some baggage. St. Jude announced in October that malfunctioning batteries in its pacemakers led to two deaths and dozens of complications for other patients. St. Jude also posted disappointing fourth quarter sales due to a delay in launching MRI-safe cardiac rhythm management products. Competitors Medtronic and Boston Scientific have already commercialized similar MRI-safe devices, said Morningstar analyst Debbie Wang in a research note. Though analysts are largely positive about the long-term effects of Abbott’s strategic shaping of the company, some question the company’s desire to pioneer new technologies rather than improving existing products. “The bigger long-term challenge for Abbott, from our perspective, will be its appetite to invest in development of more revolutionary technologies–those that address unmet needs or pioneer new markets–instead of relying on evolutionary improvement of largely optimized technologies,” Wang said. For the full year, Abbott’s net income fell 68.4 percent to $1.4 billion from $4.42 billion the 2015. Revenue fell 2.2 percent to $20.85 billion from the previous year’s $20.4 billion. Abbott owns a 13 percent stake in Mylan NV, the controversial manufacturer of the EpiPen. Mylan’s stock fell 10 percent in September due to public outrage against high prices for the allergy drug, causing a $947 million writedown in Abbott’s third quarter. The Mylan issue, in addition to St. Jude’s October pacemaker malfunctions, contributed to Abbott’s profit decrease for the fiscal year.